Congrats to everyone involved with the fresh launch of UFC Magazine! 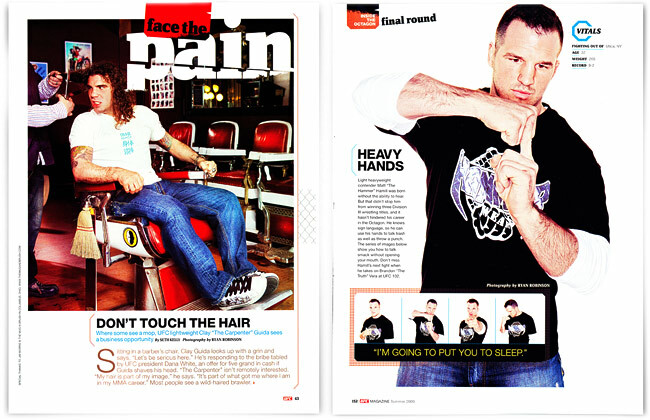 I was lucky enough to be tapped by the mighty Seth and Lisa at Men's Fitness to help create a library of portraits and backstage shots for their premier issue of the magazine, which also coordinates with the UFC 100 fight on July 11th in Las Vegas. Go to any newsstand and pick up a copy and check out the world of UFC (and some of my images). Also mark your calendars to watch it live on pay per view! Below are some other shots we got during our week in Columbus for the UFC 96.